Humewood Golf Club was rated by the late, great Bobby Locke as one of the best links courses he’d ever played and for a man with four Open Championships to his name between 1949 and 1957, he was certainly well qualified to voice such an opinion. Dr Charles M Murray invited a representative from the English design partnership of Cecil Hutchison, Sir Guy Campbell and Colonel Stafford Vere Hotchkin to visit South Africa in 1929 and it was Hotchkin – of Woodhall Spa fame in Lincolnshire – who laid out the 18 holes. Unusually, the original course had a par of 76, thanks to a configuration that included no fewer than eight par fives. Four of these holes (4, 8, 10 and 13) have since been reconfigured as par fours but the intuitive double loop routing has remained intact. More recently, Donald Steel re-bunkered a number of holes in the 1980s then all the greens were replaced by Golf Data in 2008, when a burn was also introduced in front of the par five 17th green. The signature hole on the course is the 449-yard, par four, 13th. An arrow-straight uphill hole, it normally plays into the prevailing wind and its elevated green is tucked behind a dune with a deep bunker to the left and a waste area to the right of the putting surface. 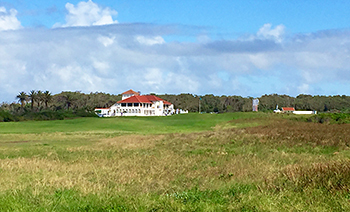 Located in the sand dunes of Algoa Bay, just south of Port Elizabeth, Humewood is a fine test of links golf where fairways are generally wide to compensate for the strong winds that can blow in off the Indian Ocean but concessions to the elements end there. The rough can be penal in places, and is complemented by dense coastal bush flanking some of the holes, which makes straight driving a priority. Bunkers on the course are not plentiful but penal whilst fairway rough largely consists of dense coastal bush that will devour stray shots. Greens are firm and fast, requiring a sure putting touch – which was certainly needed when the South African Open returned for the fifth time to this top class links in 2006 (won by Ernie Els). For those of us who have been extremely fortunate to travel the world playing golf, the identification of a ‘hidden gem’ is the Holy Grail that we all seek. Bobby Locke quite rightly once said “Humewood Golf Club is good enough to host The British Open should this Championship ever have to be played outside of Britain”. As a lover of true links golf and a native of Ireland, I couldn’t agree more. Humewood is the only links golf course in the entire continent of Africa, and with 44 bunkers it boasts a massively underrated layout worthy of major golf events. I applaud the work of Darius Oliver as tagging Humewood in his Planet Golf Top 100 courses in the World list. This links is so enjoyable and under the radar that I re-arranged my itinerary to play it twice. It epitomizes the low-key nature of those sleepy golf clubs you find in GB&I. No frills, no country club, just 100% commitments to true links golf. Among the many highlights on the front nine is the highly celebrated stretch of 2 through 6 which offer as much challenge as anything you’ll see on the Open rotation. The back nine highlights are numerous including the superb par 4 10th, and the magnificent uphill par 4 13th, which is arguably the best par 4 in the country. Of the 12-15 members I spoke with in person, almost everybody had a different favourite hole, which indicated to me the wide array of excellent holes. It’s not the longest course in the world, but length is unquestionably irrelevant when you’re on an old classic like this. The routing and design variety at Humewood would even have MacDonald/Raynor taking photographs. The members don’t know how lucky they are to have access to such a fabulous layout which I’d happily play every week. Excellent links golf course- greens and fairways in top condition. In a country where courses are often +7,400 yards it was great to play a course that you had to think your way around and not just blast the driver off the tee. A great test of golf for all levels of golfers.